International Journal of Scientific Research and Review publishes original papers in various fields of Applied Science, Technology and Engineering that cover, but are not limited to, the following areas: Electrical Engineering, Power Engineering, Mechanical Engineering, Automation and Control, Measurement and Metrology, Signal Processing, Telecommunications, Civil Engineering, Chemical Engineering, Materials Science, Computer Engineering, Information Technology and Informatics, Data Engineering and Software Engineering, Biomedical Engineering and Medical Physics. 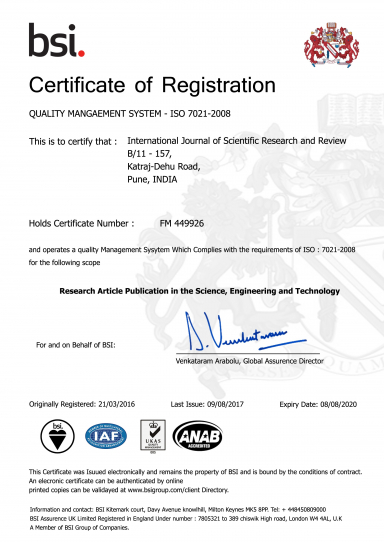 International Journal of Scientific Research and Review (ISSN 2279-543x) is a Monthly peer reviewed Multi disciplinary journal that publish original and high-quality articles covering a wide range of topics in Engineering, dedicated to promoting high standards in the creation and dissemination of scientific knowledge. This multidisciplinary international journal accepts research and review papers in the field of Engineering and other fields on the basis of its originality, importance and interdisciplinary interest. Articles that simply replicate known knowledge or techniques and do not add anything new or unique to the science will normally be rejected. With its high standards of scientific quality, the Journal International Journal of Scientific Research and Review provides a meeting ground for researchers who investigate the newest problems related to Multidisciplinary fields. International Journal of Scientific Research and Review is an open access journal, which means that all articles are available on the internet to all users immediately upon publication. Non-commercial use and distribution in any medium is permitted, provided the author and the journal are properly credited. Benefits of open access for authors include: free access for all users worldwide, authors retain copyright to their work, increased visibility and readership, rapid publication, no spatial constraints. Special issues dedicated to international conferences in the topics of the journal are brought out, as well. 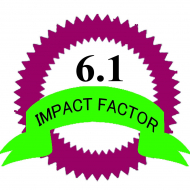 All submitted manuscripts are initially evaluated by the Editor and, if are found suitable, are sent for further consideration, to peer reviewers for an independent and anonymous expert review process. We found some unprofessional news circulated about dynamic publisher as imitation journal from other journal. Here we are displaying the original ISSN proof assigend from International ISSN center. Dynamic Publisher is truly an international journal.